Gelsemiaceae is a family of flowering plants, belonging to the order Gentianales. The family contains only three genera: Gelsemium, Mostuea and Pteleocarpa. 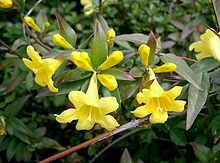 Gelsemium has three species, one native to Southeast Asia and southern China and two native to Central America, Mexico, and the southeastern United States. The eight species of Mostuea are native to tropical areas of South America, Africa, and Madagascar. The two genera were formerly classified in the family Loganiaceae. Pteleocarpa was originally placed in Boraginaceae or in its own family Pteleocarpaceae, but it is most closely related to Gelsemiaceae with which it shares significant characters. The family Gelsemiaceae was described in 1994. It is distinguished by having no latex or stipules and by having heterostylous flowers with yellow to white corollas and superior ovaries. In 2014, a molecular phylogenetic study of the lamiids (aka Garryidae) resolved Gelsemiaceae as sister to the anomalous genus Pteleocarpa. The authors of that study believe that Gelsemiaceae should be expanded to include Pteleocarpa. The APG IV system published in 2016 includes Pteleocarpa in Gelsemiaceae. ^ Nancy F. Refulio-Rodriguez and Richard G. Olmstead. 2014. "Phylogeny of Lamiidae". American Journal of Botany 101(2):287-299. doi:10.3732/ajb.1300394. Wikimedia Commons has media related to Gelsemiaceae. This page was last edited on 25 January 2019, at 18:10 (UTC).